The Boston Red Sox will once again host a weekend getaway of hot stove fun for fans and families January 19-21. 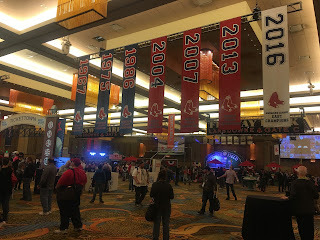 The fourth annual “Baseball Winter Weekend” at Foxwoods Resort Casino in Mashantucket, Connecticut, includes a Town Hall Meeting with Red Sox leaders, autographs and photos with Red Sox players, and round-table discussions on a variety of baseball topics. The weekend also includes a full baseball festival for fans of all ages and clinics for kids. Weekend passes, which include the option for hotel accommodations, are on sale now on redsox.com/winterweekend. Passes provide access for all three days and are $65 for adults and $20 for children 14 and under. Children two and under are free. Red Sox Season Ticket Holder prices (for adults) are $55 and their children’s price is $15. Mastercard is the preferred payment network of the Boston Red Sox and its cardholders will have special opportunities at Winter Weekend. The first 30 guests to purchase Winter Weekend tickets with a Mastercard will be invited to a private meet and greet with Red Sox players and uniformed personnel. In addition, guests who present their Mastercard upon arrival at Winter Weekend will be given priority access and a fast-pass to the autograph corral they have been assigned. The entire Red Sox roster, including coaches, is invited to attend. Red Sox alumni, Wally the Green Monster and his sister Tessie will also be in attendance. The weekend will begin Friday night with the introduction of the participating players, followed by a fan-interactive Town Hall Meeting with Red Sox leadership on hand to answer questions from fans. The Town Hall event will be televised by NESN. Throughout the day on Saturday, fans will have an opportunity to get autographs and take photos with players, see the three World Series Trophies, and Red Sox artifacts such as Silver Bats, Gold Gloves, MVPs, and Cy Young Awards. A series of baseball clinics for kids conducted by Red Sox coaches and alumni will also take place throughout the day on Saturday. Family-friendly activities include wiffle ball on the indoor field, a virtual reality experience, batting and pitching cages, the chance to meet Wally and Tessie, and a special screening of the 1993 movie ‘The Sandlot’ on Saturday night at the Fox Theater. Panel discussions with current and former players will also take place throughout the day on Saturday with the return of popular favorites like the kids-only press conference and a game show presentation with members of the 2018 team. In an effort to accommodate more fans, this year’s panel discussions will all take place in the Fox Theater. NESN will broadcast live from Baseball Winter Weekend on Saturday with interviews with Red Sox players and leadership. Winter Weekend attendees will also have the opportunity to meet the network’s broadcasters and to participate in a casting call for NESN Clubhouse, the award-winning, commercial-free, pre-game show for kids that airs 90-minutes before Red Sox games on Sundays. Winter Weekend concludes on Sunday with Breakfast with Wally and Tessie, a mascot-themed breakfast for children and families. Tickets for the breakfast are available at redsox.com/winterweekend. Fans are encouraged to check redsox.com/winterweekend periodically for updates on participants and activities. NOTE: We are providing this information to our fans as we are Red Sox Parents. No other compensation was provided. Their bartenders are nice and friendly. We stayed till closing and weren't ushered out or anything. Definitely want to go to this venue New York again and see if their unlimited drinks brunch is worth it!